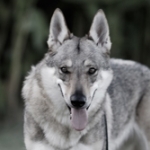 This is a follow up to our earlier paper on initial observations working with Czechoslovakian Wolfdogs (CSV). The paper is not exhaustive in nature, but is intended to provide a degree of additional elaboration on our experience. We will not repeat what is contained in the initial paper, but will present this section simply as a set of anecdotal observations. We are primarily a dog sports competition-training kennel, we train in IPO sports, KNPV and some agility sports. We work primarily with Belgian Malinois and Dutch Shepherds. We undertook an experimental program with the CSV, because of an interest in learning about the breed and its training potential, and because we felt it was an area that had not been explored in a very systematic way. The CSV is a relatively young breed, and information on training, training approaches and the results of such approaches is not very extensive. Unlike many other breeds of working dogs there are also no clearly defined working lines within the breed. We have now had a period of over two years since we started trying various training protocols with CSV ranging in age from puppies to 4 year old adults. We shall initially address what we have observed with puppies and young dogs. One of the issues of concern and curiosity for us was the question of whether the shyness we observed with several adult dogs (dogs that arrived here as adults) was to what degree the shyness was genetic as opposed to a lack of socialization. While we believe that there is some genetic disposition towards shyness, we also conclude that this occurs in the absence of socialization. While it could be said that this is the case with many dog breeds, we believe that it is potentially more extreme with the CSV. We have worked with 4 puppies born here in Thailand from a very shy mother (who arrived as an unsocialized adult), 3 dogs that arrived at less than 8 weeks of age, and 3 that arrived at less than 6 months of age. All of these dogs were given a wide range of socialization. This included extensive time in the house, exposure to a wide range of people, exposure to a wide range of places, noises, objects and obstacles such as stairs and elevated walks. With this basis of socialization none of the dogs developed any significant degree of shyness towards people or new situations. Of these 10 dogs, only one demonstrated a slight tendency towards caution with new situations but overcame his initial hesitancy quite quickly. It is important to note that as with any dog, but even more so with the CSV which is quite sensitive, attempting to comfort the dog when it shows fear, (reward) will only reinforce the fear and should be avoided. Our experience with the CSV is certainly more limited than a number of others, but we have observed that there appears to be three distinct developmental behavioral phases. The first phase is what we will call the puppy/personality development phase. This lasts until approximately 6 months of age. The foundation personality appears to generally lock at this age. What we mean by this is that this is the period of primary socialization. With proper socialization the resultant behavior is dog like, without it you have a shy animal. It appears very difficult to undo this. CSV that we have seen that were not properly socialized in this period, can bond into a family environment where familiarity will lead to contact, but they will always be shy and cautious outside of this environment. The puppy stage is marked by a very active amount of play, including play with balls and tugs. The interest in balls and tugs and similar toys appears to diminish greatly after this age in most CSV, although we have one CSV that arrived from Lithuania who continues to have considerable ball drive at the age of 14 months. We should further comment that there is no apparent native apport or retrieve drive/instinct in the CSV. Between the age of 6 months and somewhere between 15 and 24 months is a juvenile period of exploration and maturation. This continues to be characterized by a high level of activity and curiosity. If one is considering keeping a CSV, they need to be aware that the first 15 months can be rather tumultuous, and there can be considerable destruction to one’s property without proper precautions. In general what we would term puppy like behavior continues longer with the CSV than most other working breeds we are familiar with. The final phase is what we would term adult phase. The CSV exhibits a calmer demeanor and a better understanding of rules and boundaries. At this age they are much easier to handle, and deal with. This is not necessarily the case if one intends to provide training in obedience or agility. This should be started quite young to set up a routine and maintain interest. In training we have found that food drive and consequent food reward are the best methods to maintain interest. A CSV can become bored very quickly with repetitive training, food helps to maintain interest. We have combined this with clicker training and it has proven to be quite effective. To date 8 CSV have successfully completed their IPO BH exams, and two have passed IPO tracking modules. We have experimented with a number of different types of training approaches and training disciplines. We have attempted to gauge interest and practicality of the CSV in protection work, obedience, tracking and agility. All types of training with CSV have been what we will term positive training, it is not a breed that will take strong corrections. For protection work, simply put the CSV is not practical for deployment in this type of work. It is possible to teach a CSV how to do basic bite work, but they do not exhibit positive aggression drives, and will act only defensively. For people thinking of protection sports this is in our view the wrong avenue for this breed. It is however interesting to note the following. The CSV has a very strong pack instinct with respect to protection. When the CSV is part of a pack with other dogs, or by inference a family, if it perceives that a pack member is under threat, it will act positively to go after the “attacker”. We have observed this on numerous occasions. We have read a number of times that the initial deployment of the CSV with the Czechoslovakian Army was for border patrol and they were deployed in groups. This now makes more sense, as behavioral indicators that we have seen would tend to support the notion that a pack group would actively go after a target where an individual would not. Conditioning training based on a type of prey drive would have allowed for this behavior to develop and be reinforced. It is not however either practical or advisable for personal or home protection. We do however believe that a CSV in a home environment would have some natural tendencies to protect the owner if the dog is bonded with the owner. In obedience work the CSV is not at the level of the top working breeds in that it is very deficient in retrieve exercises. It also does not like highly repetitive training exercises and gets bored more easily than many other working breeds. In addition to this, the CSV is rather more independent, and if it is not interested it will simply “check out”. Heeling, basic obedience, jumps and recalls are quite good and not difficult to train. There is as observed earlier a need to maintain reward and motivation, or the CSV will become bored. Speed of response is dependent on holding focus as well as what we will term bond. The CSV tends to bond very strongly with a handler/owner and family member, in our experience more so than most breeds. It will to an extent perform certain tasks out of bond, not simply for reward. Tracking and search are areas that the CSV potentially excels at. We work a lot with Malinois and Dutch Shepherd’s, both of which are quite good at tracking and scent detection. The CSV, exhibits a better natural sense of smell than either of these breeds. For sports tracking the CSV is not necessarily a natural depending on discipline. In IPO where stylized ground tracking is the norm, the CSV operates on a combination of air and ground scent, it can be trained to only ground scent and to lay down on objects, but it takes much longer than with a Malinois. For purposes of finding a specific object or person by a combination of air scent and ground scent, the CSV is virtually a natural. Once it understands what is wanted it is able to carry out this exercise very effectively and appears to enjoy this type of work. We have not attempted any specific scent discrimination work, so we cannot comment on the breeds suitability for drug detection or bomb detection. However, given the innate strengths in this area, it is reasonable to believe that with proper training the CSV would do well. Again it would be a matter of motivation and maintenance of interest that would be critical in training. For certain types of scent work the CSV’s natural tendency not to bark could be quite useful. As many CSV owners will confirm the CSV is a very good natural jumper. This has been proven many times as they easily jump over kennel walls that owners think will keep them in. In agility work, the CSV’s appear to learn quite quickly and to enjoy this type of work. They may not be quite as agile as some of the smaller breeds, but they generally hold their own quite well and again using food as a reward, they learn agility exercises quite quickly especially the jumps. The CSV exhibits a better memory than most breeds so its actual ability to remember an exercise format is quite good. Our experience in training the CSV and the level of success was directly tied to the early socialization process. There were two female adults that arrived without socialization. They proved to be untrainable beyond very basic obedience, and we were not able to overcome their shyness, beyond simple personal bonds in a home environment. This is important to keep in mind if you are thinking of acquiring an adult CSV. It is extremely different from most other breeds. We have worked with a number of working breeds with unsocialized adults and found that this could be corrected over time, this was not the case with the CSV.